By the time the Oilers hosted the Flames on March 19th, 1982, Gretzky had in his possession the trio of NHL single season scoring records with most goals, assists and points. With every additional goal and assist Gretzky picked up he was going further into uncharted offensive territory and raising the bar higher than anyone ever thought possible. On this night the Oilers and Flames fought to a 3-3 draw but Gretzky came out the winner scoring his 88th goal and 199th point of the season. The goal marked the 500th point of his NHL career and was accomplished in a record low 234 games. The official NHL Inglasco goal puck was plucked from the net that night and later mounted (with tape) onto a 7"x 9" wood display plaque that has a pre-drilled wall mount hole in the center. 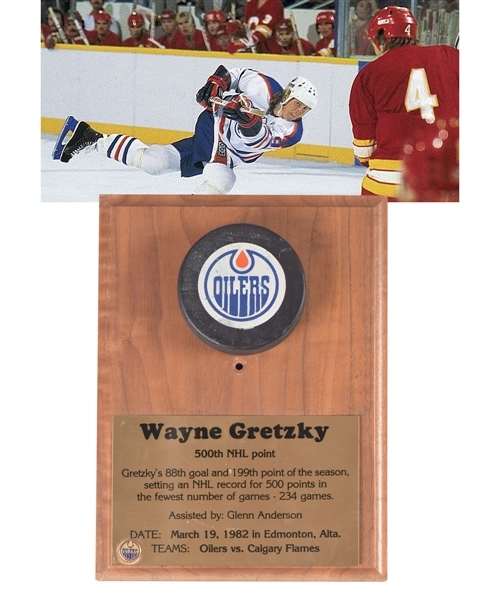 A brass plate with laser engraved black text captures the details of this great moment in Gretzky and Oilers history. Originating from the archives of the Edmonton Oilers, a signed LOA from past Oilers’ GM and current vice-chairman of Oilers Entertainment Group Kevin Lowe will accompany.